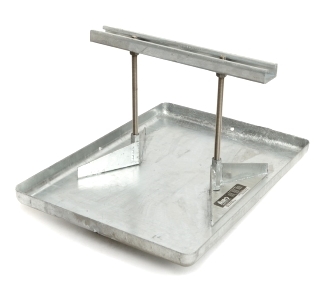 Pipes rest on a 12" length of Unistrut which is mounted on a Hot Dipped Galvanized Steel base. Pipes can then be fastened by using typical clamps and hardware locked to the Unistrut. Base Size: The base is 12" by 16". Max Pipe Clearance: Can adjust in height from a low of 4-1/4" to a high of 7.5" in elevation above the roof membrane. Max Load Weight: Maximum load weight may not exceed 223 lbs. per pipe stand. Spacing: Manufacturer's recommended spacing is not to exceed 10 foot centers depending upon the load. Do not exceed 100 lbs. load weight. Miro Model 2.5-Conduit Support-5 Rooftop Conduit Support System, 12 in. wide Unistrut®, Height adjusts from 2.5 to 5 inches with a 7-1/2 x 10 inch Polycarbonate Base. 1-Unit. Price/Each.